When we visited the Universal Studios in Hollywood I was expecting a quaint backlot tour with maybe a peek into some studio currently filming. Boy, was I wrong. This is a full-on theme park complete with a shopping/ entertainment area before even reaching the park. The Universal Citywalk alone could occupy a day – or even better, an evening – complete with shops, fun restaurants, movie theater, a comedy club, and free live entertainment on the weekends. But we were on a mission to get to the Studios and didn’t stop at the Hard Rock. In our party were four adults and three teenagers. Although the park seems a little smaller and the lines shorter than other area theme parks, we spent an entire day of fun at Universal. We started off going to the back – actually lower lot – of the park for three mega-rides. This seemed to help as far as wait time in lines. One handy feature that helped us know this was that we could use our smart phones to check line wait times. All theme parks should do this. The first ride we went on was Transformers The Ride: 3D. It’s a flight simulator combined with 3D technology. Although several others in our party thought this was the best ride of the day, I did not. It was good, but I found it to be like Michael Bay’s movies – the plot got in the way of the enjoyment of the effects and thrills. Believe it or not, we loved waiting in line – they had decorated the waiting area as a set where we could press buttons and turn levers and watch a video setting up “our mission” for the ride. 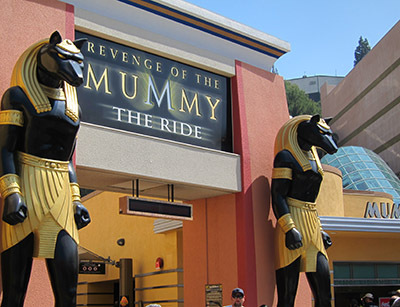 Next we rode Revenge of the Mummy The Ride. Another fun wait in line – and this ride was much more fun and straightforward. It was a coaster with lots of plot elements from the movies. The last ride we rode on the lower lot was Jurassic Park The Ride – the water ride. It was almost like a combination of the old-fashioned boat rides with the dinosaurs and other story elements from the movie, except that the dinosaurs came at you and the ride was much more exciting. Jurassic Park gives plenty of opportunity to get wet – not drenched, but certainly splashed a good number of times. We lunched at the Flintstones Bar-B-Q, which was quite delicious and gave a unexpectedly large amount of food. We were all pleasantly surprised. It was tough to get tables for seven people together, even at 1pm and we ended up having two people hold two tables while the others stood in line for food so we could sit together. Our party then went to stand in our longest line of the day at The Simpsons Ride. Again, it didn’t seem long because of the entertainment. Be warned: If you are offended by the Simpsons show, the line itself will probably be distasteful to you too. The ride itself was perfect – just the right amount of thrills and show details on this virtual rollercoaster. This was my favorite ride of the day. We watched two shows throughout the day: the Special Effects Stage and Universal’s Animal Actors. Both shows were a mix of pure entertainment and actual information about special effects and how they train animals for shows. Both shows included audience participation. The animal show featured several actual movie stars, such as the dog used for “Marley and Me,” and some animals still in training. Each show was short and a nice break from standing in line. 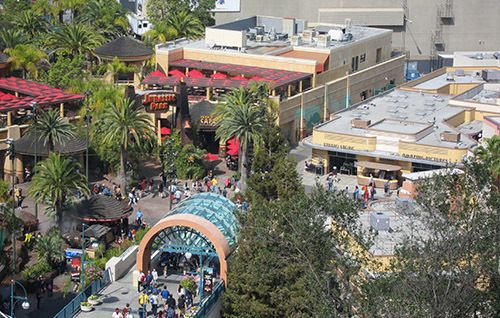 The last thing we did was take the Back-Lot Tour – a must when coming to Universal Studios. They’ve got tours in several different languages: they had a separate line for tours in Spanish and the last Mandarin tour had just finished when we got in line. Again, waiting in line was easy as they had TVs playing movie clips and there were lots of posters featuring all sorts of different movie aspects, stars, and facts. The tour itself was as only Universal could do it – it was a mix of facts about the sets we were seeing and some experiential 3D rides. The ride part was mild compared to the rides we had already taken, but if you’re not expecting them, they can be quite surprising. We had to stop a few times and have some “quiet time” while we rode past several sets where the studios were still filming shows such as CSI, but that was cool as it reminded us that we were on a real working studio. In fact, when you walk in the park, you can look to see which shows are being shot that day. So while we were on the tour, we kept an especial eye out for those stars from the shows we knew were on set. If you do bring children, there are plenty of rides, shows, and play areas for them as well. The studio also has a feature for lines called Child Switch where everyone can wait in line together, then one adult can stay with the child while the rest of the party rides, then switch places so that the remaining adult can ride also. We saw several taking advantage of this. We did not make it to the Shrek 4D show nor the WaterWorld as they looked a little more mild nor did we make it to The Blues Brothers show. Only a few in our group went to the House of Horrors. I didn’t go, but the four who did said it was very good. Even the most seasoned haunted house guy was “gotten” a couple times, which speaks well for their set-up. Universal Studios offered close parking, which we did not take advantage of. I assume this would mean not walking through the Citywalk, which wasn’t that far. They also offered front-of-the line Priority Access passes. We did not purchase these either and I’m not sure that I would have wanted to at the price. We were there the week before Easter – when many people have spring break. It was definitely crowded, but the lines were not nearly as long as at some other theme parks. The longest we waited was just over an hour and as stated above, the wait did not seem long because of the entertainment provided in line. 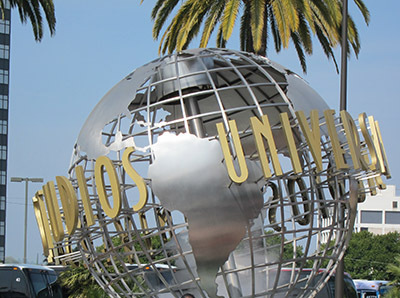 Altogether Universal Studios is quite an interesting mix of thrills, film history, and fun and we definitely recommend it! Universal Studios Hollywood Theme Park Review by Dawn When we visited the Universal Studios in Hollywood I was expecting a quaint backlot tour with maybe a peek into some studio currently filming. Boy, was I wrong. This is a full-on theme park complete with a shopping/ entertainment area before even reaching the park.